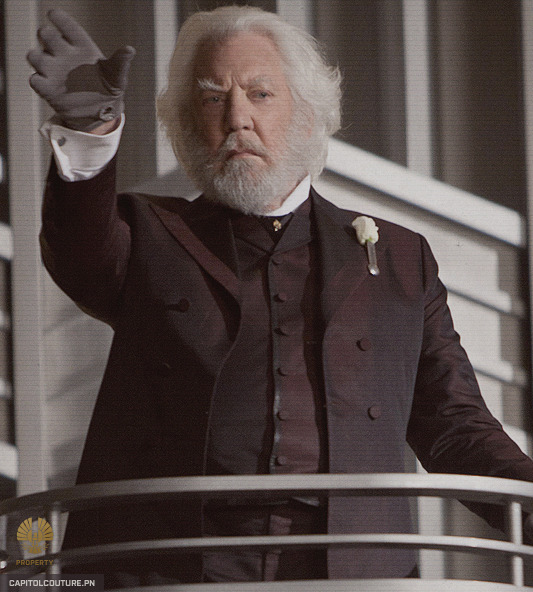 President of Panem. Figurehead of the Capitol. Icon of style? You bet your Brioni britches! With his ever-present white clergy shirt and dark sanguine button-up vest, President Coriolanus Snow is making a strong case for the ancient adage “less is more” — a concept about as foreign to Capitol fashionistas as D4’s bread. Speaking of D4, the leader of Panem’s Execu-chic branch always completes his classy ensemble with an impeccably tailored equally sanguine sharkskin jacket. It’s one-of-a-kind and was given to him by D4’s mayor Hunter Phillips on his very first Presidential Tour of Panem over 25 years ago. I’m sure we’d all agree: If you absolutely have to visit the Districts, a gorgeous sui generis sharkskin sport coat will serve just fine as a goodie bag. This entry was posted on March 9, 2012 at 7:16 pm and is filed under Reviews. You can follow any responses to this entry through the RSS 2.0 feed. You can leave a response, or trackback from your own site. I didn’t find him scary enough. Perhaps that will come out later.